Blade and a J-cut, two bits! Final Cut Pro X doesn’t do J-cuts. It doesn’t do it at all, and whilst I am not an aggressive or violent person, I feel the need to sit on a naughty step for thinking what I’d like to do to this bit of software if it were something tangible. What am I talking about? Any editor will tell you that, in ‘How To Edit 102’, we learn about the J cut. Very simply, it’s when a simple cut between two shots has the audio of the second clip start at just a fraction before the picture starts. 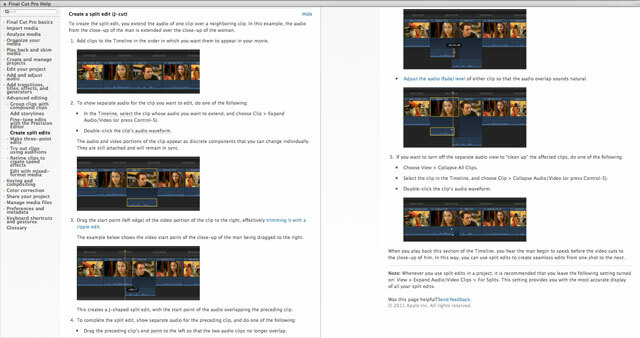 Or, put it another way, the second shot starts with new audio over the old shot, then the video cuts to the new shot. Let’s imagine a string of 3 comments by 3 different people. When we see this in television and film, it mimics our every day experience, and it feels very natural. Comfortable. It’s an editing ‘condiment’. Like adding a bit of salt to food, it’s not clean and pure, but it feels right. 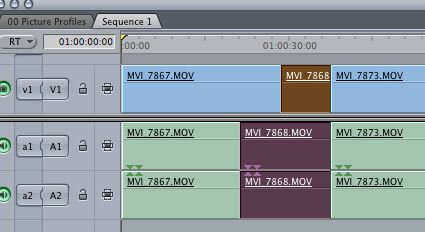 So looking at the clips in the timeline, there’s an offset between when the audio cuts, and when the picture cuts. It works both ways: if sound cuts before picture, it’s a J (see how the tail points to the left, indicating the lower (audio) track starts first in our left-to-right scan. J-cut. If the pictures cut first and then the audio cuts, we get an L-cut – visually speaking. SO we cut our first take of a sequence, and we’re really trying to get the sequence of what people are saying in a logical sequence. Let’s not worry about pictures and cutaways now, let’s get the ‘radio programme with pictures’ version done. Sometimes, it gets messy and we’re cutting little bits of words and halfwords together so a parenthetical comment is allowed to stand alone. So long as it sounds right, we’ll cover the messy pictures with their jump cuts with a cutaway. It’s like trying to put hospital corners on a duvet: it can be done, but that’s an awful lot of effort for something that should be quick and simple. After all, when firing off a bunch of edited interviews for a client, hands up those who, in FCP7, Avid or PPro, would perhaps slip a few edits to add a little polish? Then unslide them back again to continue editing? Exactly. Well, now and again I find a really good reason to switch from PPro or FCP7 into FCPX, but then spend an afternoon bumping my shins and grazing my scalp whilst climbing through its ‘little ways’. Well, I lost my temper big-time over the whole J-cut thing and turned to good friend Rick Young for solice. He’s writing a book on FCP-X, he’ll know how to do it. But that’s quite an odd thing for an app that touts to never suffer bad sync – dangle your audio off your video for ever? Deal with a double-track for every clip that could be in a J-cut? In a modern bit of software destined for the next 10 years of editing? That’s madness! Actually, I think I put it a little stronger than that. It sounded like my solution for getting a pet dog through his dog door was to cut him in half and re-attatch with velcro once he’s through. Just live with a dog for ever more that has to be cared for in case his velcro join comes apart. Yes, I do have funny feelings about my footage, but if you were to spend so much time with them you’d go funny too. And here’s the conclusion: Rick’s method works – it works fine. It works great, in fact. Give it a try, drop that beastly Apple method. But here’s my finishing salvo: Apple’s FCPX team shouldn’t feel ‘oh that’s all right then’ and not implement an offset tool. It’s so simple: apply an Option key behaviour on the T trim tool. Thanks for XML and all that, I’m sure multicam will be great too. Just finish off your tool with a way to turn radio edits into J cuts *Just* *like* *you* *used* *to*. Put the Pro back into FCPX!